Quite a large portion of cryptocurrency related projects has had an ICO. BitDegree is no exception, the BitDegree ICO was a way to present what is BitDegree to the world and find like-minded individuals. The team from Lithuania, previously working for a web hosting company known as Hostinger, that’s been doing business since 2004 set out to create an alternative learning platform. And, only 6 months ago at the start of December 2017, the BitDegree ICO was organized. Want to know what BitDegree is doing now? Read my guide on BitDegree! Don’t know what an ICO is? No problem, read my guide to ICOs. 1.1 What is The BitDegree Token? Presenting their idea to the public and organizing the BitDegree ICO, the team managed to attract over 12 thousand contributors that collectively raised 32 thousand Ether (ETH). At the time of writing 32 thousand ETH are worth around 15million USD. BitDegree allowed the contributors to pre-purchase BitDegree services in the form of buying BitDegree tokens. During the ICO anyone could purchase BitDegree tokens at the ratio of 1 ETH:10,000 BDG. The BitDegree ICO started on the 1st of December 2017 and ended on the 29th of December, 2017. The ICO ended when the hardcap was reached, and all of the BitDegree Tokens that were available to the public were sold. A chart below shows how the BitDegree tokens were allocated. • BitDegree foundation: 66 million (locked for 360 days). • Scholarships pool: 165 million. • Token available to the public at launch: 336,6 million. • Team: 66 million (locked for 720 days). • Advisors / Partners: 13,2 million (locked for 160 days). 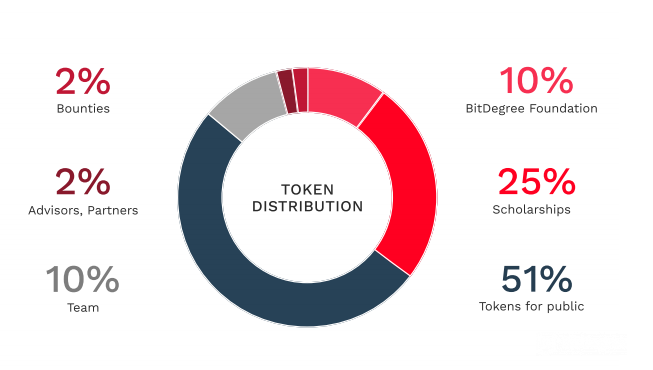 BitDegree Tokens in total: 660 million. What is The BitDegree Token? To fully understand what is BitDegree we need to talk about the BDG token. The BitDegree token (BDG) is a cryptocurrency. It has real-world value and application. At the moment BitDegree tokens can be used to pay for courses on the BitDegree platform as well as paying for the services of BitDegree partners. For example, Hostinger.com is currently accepting BDG tokens for web hosting services. So, if you bought BDG tokens during the BitDegree ICO or later and are in need of web hosting services, you can use your tokens at Hostinger. Now, the BDG tokens need to be bought on exchange platforms like HitBTC, Cobinhood, IDEX. 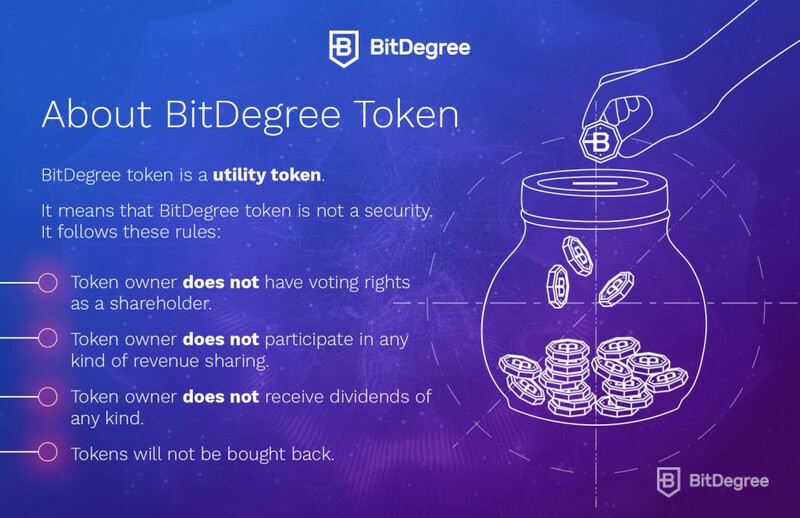 Later BitDegree plans to issue token based scholarships and reward students for learning, meaning you’ll either be able to earn tokens and continue with free education or get back part of your initial course payment by completing a course successfully. Want to buy some BitDegree Tokens? Follow my guide on How to Buy BitDegree Tokens with Ether! 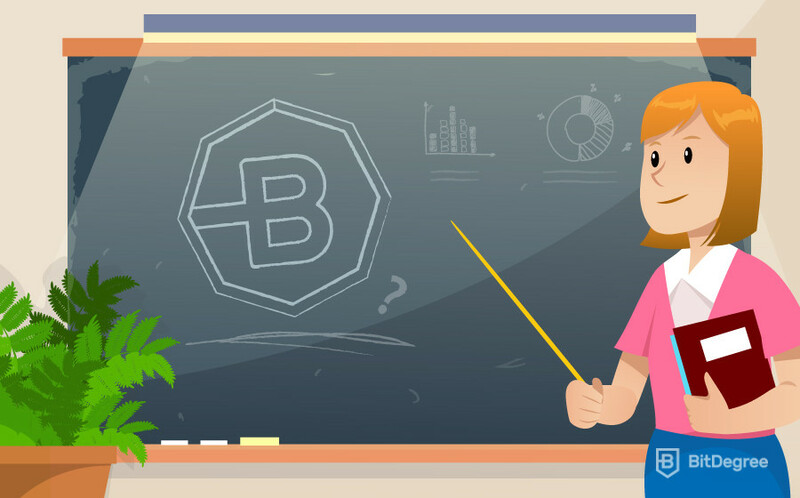 The main attraction of BitDegree over other educational platforms is that, not only you’ll have a chance to educate yourself for free. But, earn BitDegree Tokens while studying as well. The BDG token is classified as a ’Utility’ token. That means that holding BDG tokens do not infer any stakes in the company or a right to vote. Holding BDG tokens do not yield any dividends as well. The purpose of the BitDegree token is to provide easier micro-payments to learners on the platform as sending tokens via smart-contracts is easier, faster and cheaper than manual payments using the existing banking system. Not sure how smart-contracts work? Read a guide on smart-contracts here! How can learners, teachers and employers utilize the BitDegree token? All of this boils down to the co-creation of value. When all community members work together and reward each other for their efforts with BDG tokens – that’s where the token utility comes from. Learners will pay for the courses with BDG tokens. Learners will pay for mentorship and tutoring with BDG tokens. Employers and donors will issue token scholarships so that learners have an incentive to take specific courses. Learners will earn tokens for the courses that have scholarships available. One of the most critical aspects of the BitDegree token is that it allows learners feel safe because a smart-contract handles payments. IF Peter completes 5 lessons THEN send Peter 200 BDG Tokens. BitDegree utilizes the Ethereum Network. Meaning that instead of using a separate blockchain BitDegree is built on top of the Ethereum blockchain. This classifies BitDegree as an ERC-20 token. 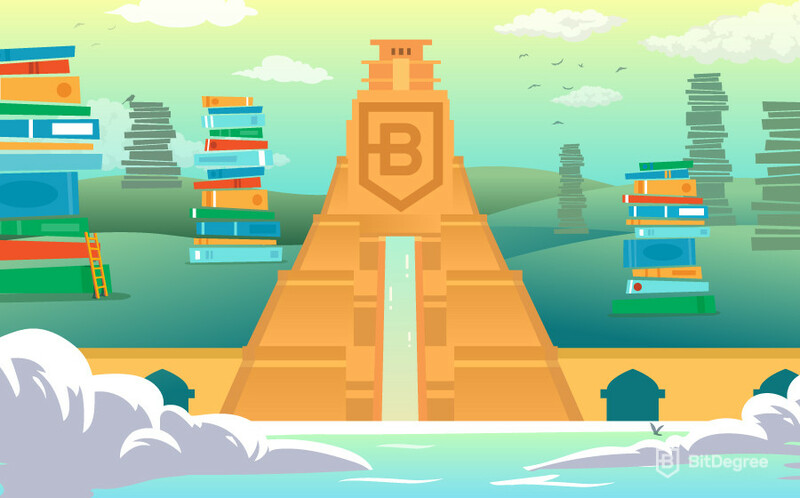 BitDegree is trying to change the landscape of education and thanks to the BitDegree ICO they are able to issue learning incentives to the students. Now you have a better understanding of how the tokens are distributed and their overall purpose in education. Following the BitDegree ICO in 2018 and forward is going to be exciting! With new developments and innovations in the education space, BitDegree is looking to create a global platform where everyone is welcomed to share their skills and grow together. With a working product already it’s all about improvement from this point on. The educational revolution is being led by projects like BitDegree, and I can’t wait to see how everything evolves! How about you? Have you supported the project during the ICO period? Or is there anything you expect to see from the project in the future? i take my hat off to you. 15 million in advance payments!!!! XLM Price Prediction: What’s the Stellar Price Prediction?